This is not the song I had intended to post this week. Indeed, I had never heard it before last Saturday night. But it formed part of Billy Bragg’s set at the EFDSS 80th Birthday Bash for Shirley Collins, and it struck me as exactly right for Remembrance Sunday. So I got the words from the Poetry Foundation website and, although I won’t claim that I’ve quite learned them by heart yet, I think this may well be a song which finds a permanent place in my repertoire. ‘The Man He Killed’ was written by Thomas Hardy in 1902, at the time of the Boer War, and first published in his 1909 collection Time’s Laughingstocks and Other Verses. Billy Bragg set the words to the tune of the traditional song, ‘The Snows they melt the soonest’, and performed it at various events – including on the Left Field Stage at Glastonbury – in 2014, commemorating the one hundredth anniversary of the start of the First World War. 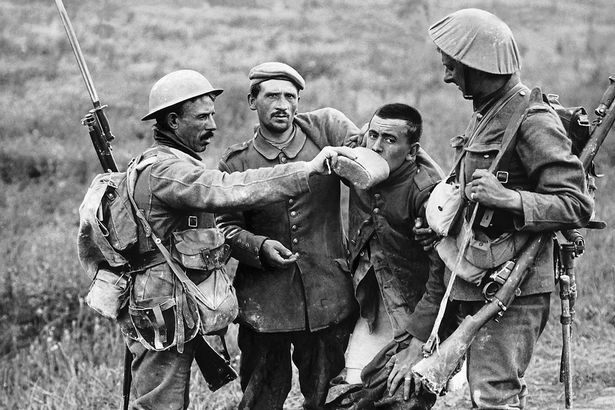 A British soldier giving a wounded German prisoner some water to drink, near La Boisselle, during the Battle of the Somme, 3 July 1916. Photographed by the Daily Mirror’s photographer Ernest Brooks. 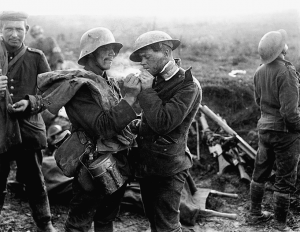 A wounded German soldier lighting a cigarette for a wounded British soldier at a British field hospital during the Battle of Épehy, near the end of the First World War (1918). Photo: Lt. Thomas K. Aitken, British Army photographer/Imperial War Museums. 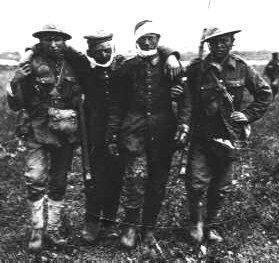 British soldiers helping wounded German prisoners on the Western Front. “The fraternising of troops in Belgium on Christmas Day 1914. Group of German soldiers with two Englishmen” – can you tell which of these men is fighting in which army? Photo by R W Turner, from the Imperial War Museum.